As a leading educator on the West Coast, Chapman University prides itself on providing students with state-of-the-art facilities and top-notch equipment. 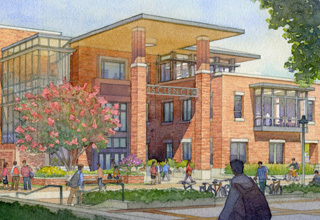 With a goal of keeping the University at the cutting edge of education, Chapman has numerous project in planning that will not only improve the learning experience and community involvement, but will add to the already stunning campus beauty. The Keck Center is the home of our Schmid College of Science and Technology and future home of our Dale E. and Sarah Ann Fowler School of Engineering. The Center’s opening in fall 2018 signals a tremendous step forward in the STEM fields at Chapman University. This facility helps power the convergence of science and technology on our campus. It also ushers in a new era of our faculty and students collaborating – across programs and disciplines – to solve global challenges. Located at the northwest corner of the intersection of West Palm Avenue and North Cypress Street, this project is nearing the final stages of entitlement and design review with the City of Orange. As proposed, it is expected to include about 400+ beds. 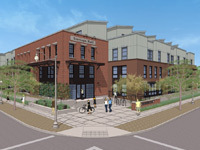 The conceptual design by the architectural firm Togawa Smith Martin, Inc. echoes the industrial character of the historic area. Depending upon planning approvals, occupancy could be as soon as fall 2019. Learn more about what step in the production process each of these construction projects are in.